AVPN invites you to the first session in the series which will bring together a broad ecosystem ranging from inclusive business owners to investors, philanthropists and government representatives. 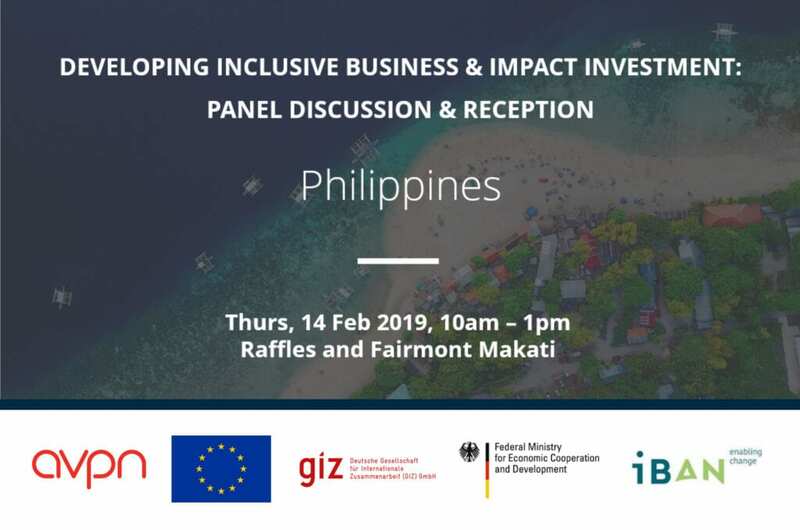 The evening will begin with a panel discussion to bring clarity to the value of inclusive business and opportunities for growth in the Philippines. The gathering will conclude with a networking reception, encouraging participants to connect and learn from one another as well as interact with both international and local experts. Mr. Ruel T. Maranan had been a Managing Director of Ayala Corporation since 2015. He is also a member of the board of Directors of Asticom Technology, Inc. and a member of the board of representatives of CIFAL Philippines. He was the Group Director of Manila Water Company, Inc. (MWC)’s Corporate Human Resources Group till 2014. In MWC, he introduced numerous innovations in human resources management, rallying behind the company’s being the first Filipino company to win the prestigious Asian Human Capital Award in 2011. Mr. Maranan earned his AB Social Sciences degree from the Ateneo de Manila University and his law degree from the University of Santo Tomas. The latter institution has recently granted him the UST 2016 Outstanding Alumni Award under Private Sector. Jollibee Group Foundation is the corporate social responsibility arm of the Jollibee Foods Corporation. Prior to joining the Foundation in 2007, Gisela was connected with the AIM-TeaM Energy Center for Bridging Societal Divides, managing collaborative leadership programs. Ms. Tiongson was formerly Regional Director for Southeast Asia of The Synergos Institute and Director for Corporate Citizenship at the Philippine Business for Social Progress. Greg joined xchange in September 2014. Prior to xchange, she was the Executive Director of social enterprise Gifts and Graces Fair Trade Foundation. She was also the Microfinance and Livelihood Manager at Families and Children for Empowerment and Development Foundation, a foundation providing services to poorest of the poor families in Paco and Pandacan. Greg completed her MBA in 2013 from IE Business School in Madrid and Brown University in Providence. She is an Asia Society Asia 21 Philippines Fellow, Class of 2007. LGT Venture Philanthropy is an independent charitable foundation, supporting organisations and companies that are contributing directly to the achievement of the UN’s Sustainable Development Goals. Paolo is part of LGT’s Southeast Asia team that manages a portfolio of investments, including inclusive business companies. He holds an MBA degree from MIT’s Sloan School of Management and a Management Engineering degree from Ateneo de Manila University.